Total # of books: 149054. Max. 5000 are shown. Annyone. An original article from Blackwood's Edinburgh Magazine, 1957. Blackwood's Edinburgh Magazine, Edinburgh, 1957. First Edition, Disbound. Very Good Condition. 11 pages. Note; this is an original article separated from the volume, not a reprint or copy. Size: Octavo. 11 pages. Quantity Available: 1. Category: Blackwood's Edinburgh Magazine; Inventory No: 245809. Blackwood's Edinburgh Magazine, 1901. 1901. First Edition, Disbound. Very Good Condition. 12 pages. Note; this is an original article separated from the volume, not a reprint or copy. Quantity Available: 1. Category: Blackwood's Edinburgh Magazine; Inventory No: 102801. From Blackwood's Edinburgh Magazine, 1837. 1837. First Edition, Disbound. Very Good Condition. Octavo. 12 pages. Very Good. Note; this is an original article separated from the volume, not a reprint or copy. Quantity Available: 1. 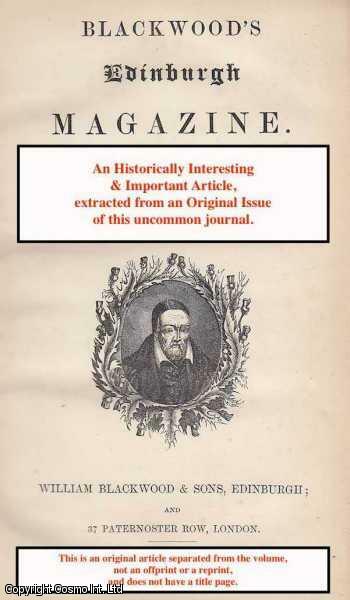 Category: Blackwood's Edinburgh Magazine; Inventory No: 092992. The City of Dion? An original article from Blackwood's Edinburgh Magazine, 1958. Blackwood's Edinburgh Magazine, Edinburgh, 1958. First Edition, Disbound. Very Good Condition. 8 pages. Note; this is an original article separated from the volume, not a reprint or copy. Size: Octavo. 8 pages. Quantity Available: 1. Category: Blackwood's Edinburgh Magazine; Inventory No: 245820. Blackwood's Edinburgh Magazine, 1838. 1838. First Edition, Disbound. Very Good Condition. 13 pages. Very Good. Note; this is an original article separated from the volume, not a reprint or copy. Quantity Available: 1. Category: Blackwood's Edinburgh Magazine; Inventory No: 106179. Blackwood's Edinburgh Magazine, 1901. 1901. First Edition, Disbound. Very Good Condition. 12 pages. Note; this is an original article separated from the volume, not a reprint or copy. Quantity Available: 1. Category: Blackwood's Edinburgh Magazine; Inventory No: 102810. Blackwood's Edinburgh Magazine, 1901. 1901. First Edition, Disbound. Very Good Condition. 10 pages. Small library stamp at foot of last page, not affecting text. Note; this is an original article separated from the volume, not a reprint or copy. Quantity Available: 1. Category: Blackwood's Edinburgh Magazine; Inventory No: 102788. Blackwood's Edinburgh Magazine, 1830. 1830. First Edition, Disbound. Very Good Condition. 10 pages. Note; this is an original article separated from the volume, not a reprint or copy. Quantity Available: 1. Category: Blackwood's Edinburgh Magazine; Inventory No: 105866. Dicken's American Notes for General Circulation. A review with excerpts. A rare original article from the Blackwood's Edinburgh Magazine, 1842. From Blackwood's Edinburgh Magazine, 1842. 1842. First Edition, Disbound. Very Good Condition. Octavo. 19 pages. Very Good. Note; this is an original article separated from the volume, not a reprint or copy. Quantity Available: 1. Category: Blackwood's Edinburgh Magazine; Inventory No: 093110. Blackwood's Edinburgh Magazine, Edinburgh, 1939. First Edition, Disbound. Very Good Condition. 8 pages. Note; this is an original article separated from the volume, not a reprint or copy. Size: Octavo. 8 pages. Multiple copies available this title. Quantity Available: 2. Category: Blackwood's Edinburgh Magazine; Inventory No: 245747. Dux, Mississippi. An original article from Blackwood's Edinburgh Magazine, 1957. Blackwood's Edinburgh Magazine, Edinburgh, 1957. First Edition, Disbound. Very Good Condition. 9 pages. Note; this is an original article separated from the volume, not a reprint or copy. Size: Octavo. 9 pages. Quantity Available: 1. Category: Blackwood's Edinburgh Magazine; Inventory No: 245812. Blackwood's Edinburgh Magazine, 1839. 1839. First Edition, Disbound. Very Good Condition. 20 pages. Note; this is an original article separated from the volume, not a reprint or copy. Multiple copies available this title. Quantity Available: 2. Category: Blackwood's Edinburgh Magazine; Inventory No: 106206. Blackwood's Edinburgh Magazine, 1905. 1905. First Edition, Disbound. Very Good Condition. 8 pages. Small library stamp at foot of last page, not affecting text. Note; this is an original article separated from the volume, not a reprint or copy. Quantity Available: 1. Category: Blackwood's Edinburgh Magazine; Inventory No: 102850. Blackwood's Edinburgh Magazine, 1901. 1901. First Edition, Disbound. Very Good Condition. 6 + 2 + 5 pages. Small library stamp at foot of last page, not affecting text. Note; this is an original article separated from the volume, not a reprint or copy. Quantity Available: 1. Category: Blackwood's Edinburgh Magazine; Inventory No: 102795. The Forgotten Doctor. An original article from Blackwood's Edinburgh Magazine, 1963. Blackwood's Edinburgh Magazine, Edinburgh, 1963. First Edition, Disbound. Very Good Condition. 12 pages. Note; this is an original article separated from the volume, not a reprint or copy. Size: Octavo. 12 pages. Quantity Available: 1. Category: Blackwood's Edinburgh Magazine; Inventory No: 245890. William Blackwood, Edinburgh, 1967. First Edition, Disbound. Very Good. 14 pages. Note; this is an original article separated from the volume, not a reprint or copy. Size: Octavo (standard book size). Quantity Available: 1. Category: Blackwood's Edinburgh Magazine; Inventory No: 217434. Blackwood's Edinburgh Magazine, 1829. First Edition, Disbound. Very Good Condition. Note; this is an original article separated from the volume, not a reprint or copy. 6 pages. Quantity Available: 1. Category: Blackwood's Edinburgh Magazine; Inventory No: 279805. The Head of Oliver Cromwell. An original article from Blackwood's Edinburgh Magazine, 1952. Blackwood's Edinburgh Magazine, Edinburgh, 1952. First Edition, Disbound. Very Good Condition. 8 pages. Note; this is an original article separated from the volume, not a reprint or copy. Size: Octavo. 8 pages. Quantity Available: 1. Category: Blackwood's Edinburgh Magazine; Inventory No: 245779. Blackwood's Edinburgh Magazine, 1901. 1901. First Edition, Disbound. Very Good Condition. 16 pages. Note; this is an original article separated from the volume, not a reprint or copy. Quantity Available: 1. Category: Blackwood's Edinburgh Magazine; Inventory No: 102786. Blackwood's Edinburgh Magazine, 1893. 1893. First Edition, Disbound. Very Good Condition. 32 pages. Library stamp in top margin of one page. Very Good. Note; this is an original article separated from the volume, not a reprint or copy. Quantity Available: 1. Category: Blackwood's Edinburgh Magazine; Inventory No: 104195. In The Beginning. An original article from Blackwood's Edinburgh Magazine, 1960. Blackwood's Edinburgh Magazine, Edinburgh, 1960. First Edition, Disbound. Very Good Condition. 17 pages. Note; this is an original article separated from the volume, not a reprint or copy. Size: Octavo. 17 pages. Quantity Available: 1. Category: Blackwood's Edinburgh Magazine; Inventory No: 245831. Blackwood's Edinburgh Magazine, Edinburgh, 1818. Disbound. Very Good. Printed throughout in double columns. A disbound article. Note; this is an original article separated from a larger volume, not a reprint or copy. Size: Octavo. 2 pages. Quantity Available: 1. 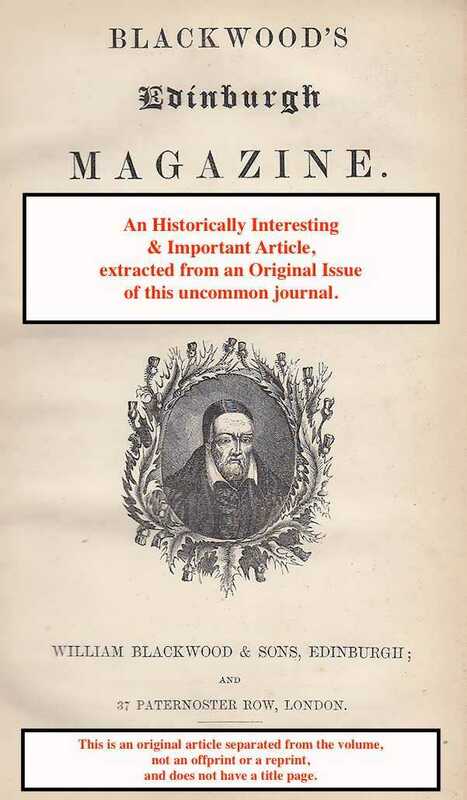 Category: Blackwood's Edinburgh Magazine; Special Interest; Featured; Inventory No: 258230. Blackwood's Edinburgh Magazine, Edinburgh, 1928. First Edition, Disbound. Very Good Condition. 9 pages. Note; this is an original article separated from the volume, not a reprint or copy. Size: Octavo. 9 pages. Quantity Available: 1. Category: Blackwood's Edinburgh Magazine; Inventory No: 245733. Blackwood's Edinburgh Magazine, 1833. 1833. First Edition, Disbound. Very Good Condition. 7 pages. Note; this is an original article separated from the volume, not a reprint or copy. Multiple copies available this title. Quantity Available: 3. Category: Blackwood's Edinburgh Magazine; Inventory No: 105940. Blackwood's Edinburgh Magazine, Volume LX, August 1846. 1846. First Edition, Disbound. Very Good Condition. Pages 249-260. Note; this is an original article separated from the volume, not a reprint or copy. Quantity Available: 1. Category: Blackwood's Edinburgh Magazine; Inventory No: 181889.